These crab samosas are a delicious and original canapé to serve up at any drinks party. 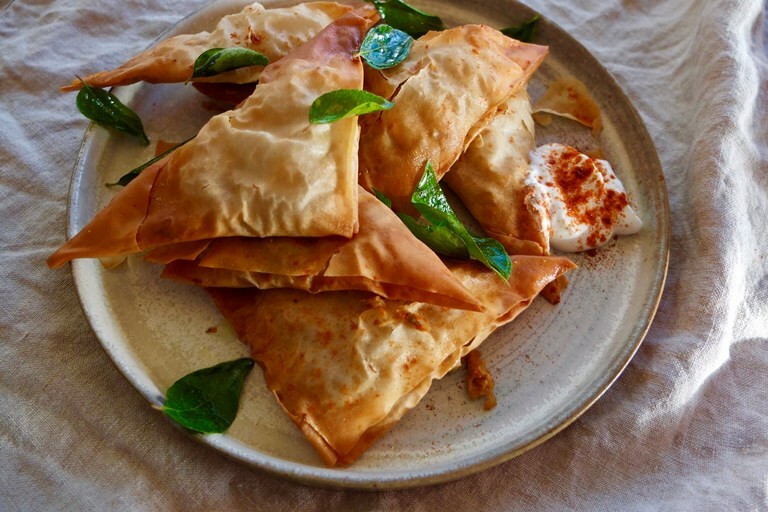 Filo pastry gives the samosas a deliciously brittle crunch, without the need for a deep-fryer. The pastry gives way to a moreish sweet and spicy crab filling, flavoured with black mustard seeds, curry leaves and turmeric. This inventive twist on the samosa is seriously moreish, especially served with a pot of cooling yoghurt to dip into. They’re made using filo rather than the traditional samosa pastry, for a speedy Christmas canapé version. If you want to use samosa pastry, they will need to be deep-fried rather than baked.